Tara arrives at Steed's flat to find he is being held prisoner there—babysitting a neighbor's baby. It's hard to dislike this one—it's very nearly as good as "All Done with Mirrors." Smartly written as a send-up to The Prisoner, it shines mostly due to Linda Thorson's fine comic performance. The only strike against it, which hardly diminishes its merits, is that it features so many recognizable Avengers alumni (what I call "doppelgangers") that it's like old home week at the hotel. 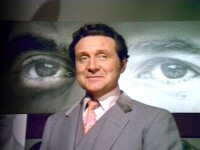 Tony McKay spotted the post-laser blast painting from "From Venus With Love" on the wall of an office at the start of this episode. 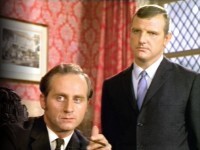 Dudley Foster appeared in the Police Surgeon episode, "Operation Mangle." Howard Blake composed the incidental music for this episode. Edgwarebury Hotel, Elstree, was used once again as a location. On Location provides several views.